The eye injury in Venezuela (Norwegian): NFF avslørt igjen: Øyeskade fra seminar mot pyro var skade fra stålsplint i 2010. I Venezuela. We warned the Norwegian Football Federation (NFF) about the report, in the summer of 2017. We were concerned that the material from the UEFA report where just a random image compilation of graphic injuries, put together to scare clubs and other officials. We were then quite surpriced to see that NFF less than 2 years later actually did hire UEFAs Dr. Tom Smith for a 2 hour presentation in March 2019, on a safety seminar for the clubs, police and fire department. People in the room were stunned by what came on the big screen. Some images were sent to me from the presentation, showing injuries that where not in the report to begin with. I started reverse-searching the images to find the original source. One of them led to an incident in Rotterdam new years eve 2014. One of the slides of Dr. Tom Smiths UEFA-presentation. Note the image in the middle. What happened to Roxanno Winklaar was not in a stadium, nor was it with any ordinary piece of pyro used in the stands. He was struck by a home made bomb made from petroleum and one or more Cobra 6 strapped together. He spent 2 weeks in a coma and was permanently disabled. Another photo to the right in the same slide showed an eye injury. 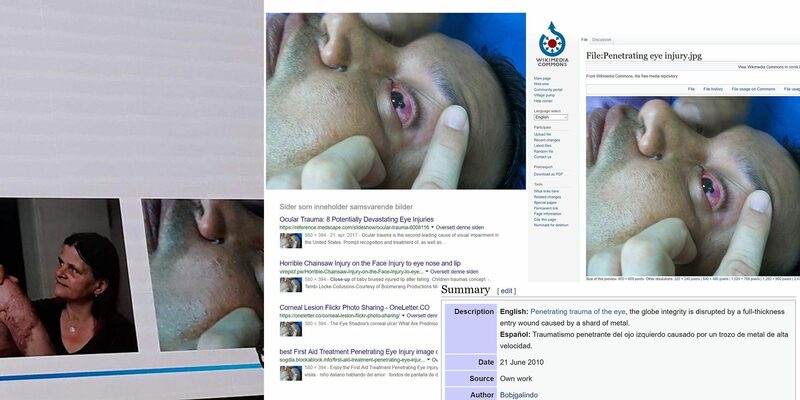 When tracking down this photo it leads to Wikipedia Commons and the user profile of an employee at a hospital in Maracay, Venezuela and was taken 12:45 on June 10th, 2010. Penetrating trauma of the eye, the globe integrity is disrupted by a full-thickness entry wound caused by a shard of metal. No reference to any kind of football or pyro incident. They don’t even play football during summer. Reporter Carel van der Welden, who wrote the article for AD.nl about Roxanno, was interviewed by Norwegian newspaper Aftenposten. 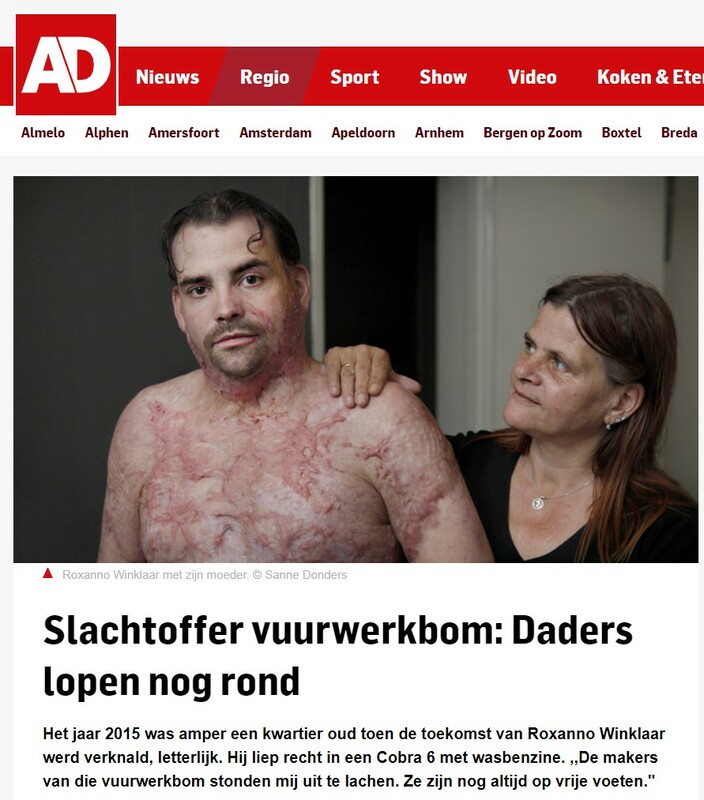 This is Sanne Donders photo, she took it when I wrote the article about Roxanno. I’ve spoken to her, and she’s sad to hear that the photo is used without permission. He (Dr. Tom Smith) has not contacted me, Sanne or Roxanno himself. This is very surprising. We were shocked when we heard it. This accident was a result of young criminals who made a bomb from bangers strapped together and lit with petroleum. It has nothing to do with pyro used in football games. This is a wrong example to use, which is surprising when you want to be a credible person with a credible story. Strømsgodset SLO Dag-Henning Borg approached Dr. Tom Smith after the presentation and asked for the sources for these images. He was told that this was the property of UEFA and could not be given out. When, as a matter of fact, UEFA hadn’t even asked for permission to use the images at all. The Norwegian Football Federation were confronted with the discovery in articles on this website, Idrettspolitikk.no and by Norwegian newspaper VG and Aftenposten, and claimed that Dr. Tom Smith has to answer for the presentation himself. NFF does not comment on the fact that they were warned on beforehand regarding exactly this. NFF also stated that “the safety of children will always come first“, and hereby trying to construct a polemic where the supporters want to risk the health of children, and the NFF is there to protect them. – The dangers of pyrotechnics are well documented, said the organisation that was just caught presenting fraudulent documentation regarding the dangers of pyrotechnics. I absolutely stand by the thrust of the report and presentation. They key message remains – pyrotechnics have no place in the spectator areas of stadia. As the report clearly states some of the images are illustrative of the types of injuries I have seen as part of the expert witness work I have done for the UK Courts, but of course these images are privileged and cannot be released. There are plenty of images within the report which are obviously incidents at stadia. Actually injuries from pyrotechnics in crowded places are the same wherever they occur, and plenty of images from recent incidents illustrate the destructive power of pyrotechnics in stadia. Nothing diminishes the fact that pyrotechnics have, as the report concludes, no place in spectator areas of football stadia. The safety distances on pyrotechnics cannot be met, and the combustion by products have very significant health effects. 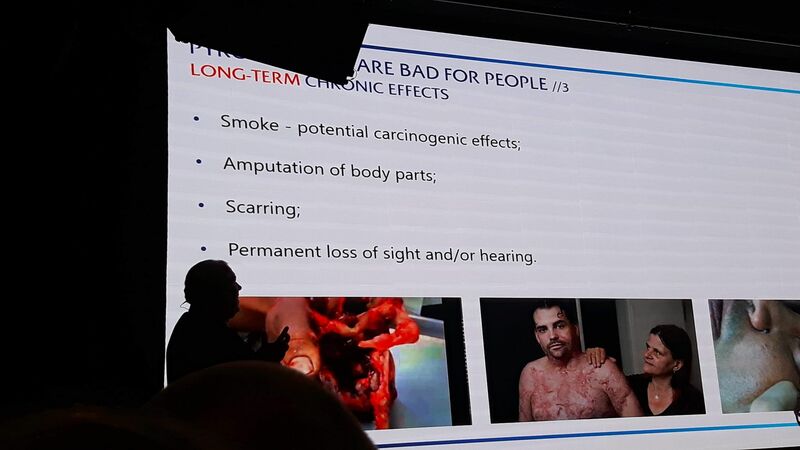 Dr. Tom Smith has not answered any questions, from us or from the media, on why he used pictures of injuries that were not related to pyrotechnics, the critisism on using scaremongering or any questions regarding ethics using these images in the presentation. He has not yet commented on the reaction from the dutch journalists who had their image stolen and used out of context. Our memories works in a way where we remember bad things better than the good ones. This is one of our most primal assets when we sense fear and make precautions, fight or flight. UEFA and Dr. Tom Smith is now using this method on you, your clubs and your police officers to give the impression that stadium pyro causes more accidents and more serious injuries than in reality. And what people remember when they go home from a seminar like this is the face of bomb victim Roxanno amongst other grim injuries, unaware that they have been fooled by UEFA. Legal pyro shows in Norway has so far resulted in more than a hundred shows with no recorded injuries. Instead, UEFA and NFF decides to construct a fraudulent backdrop for clubs, police and officials to serve their own agenda. UEFA claims the report is “evidence” that pyro cannot be used safely, and disregards completely that the actual evidence is right here in Norway. But since it didn’t fit their view, they made their own evidence with stolen pictures. Supporters deserve to be trusted and listened to. We’ve written about this in a previous article about the legal pyro in Norway. And if your objective is stadium safety, the least we expect is truthfulness and honesty. Why else should UEFA and NFF claim to be responsible for our safety?